Debuting during this year’s EXPO Chicago, Chicago’s lakefront will soon be home to a 33.3-foot-tall stainless steel figure. The sculpture, entitled Looking Up (2015) was produced by American artist Tom Friedman. In a collaboration between the Chicago Parks District, Luhring Augustine, New York and the Stephen Friedman Gallery, London, the gigantic figure will be on display at 4800 S. Lake Shore Drive from September 21, 2016 through September 30, 2017. The one-year exhibition will add to the parks already diverse and expansive collection of art pieces throughout the city. 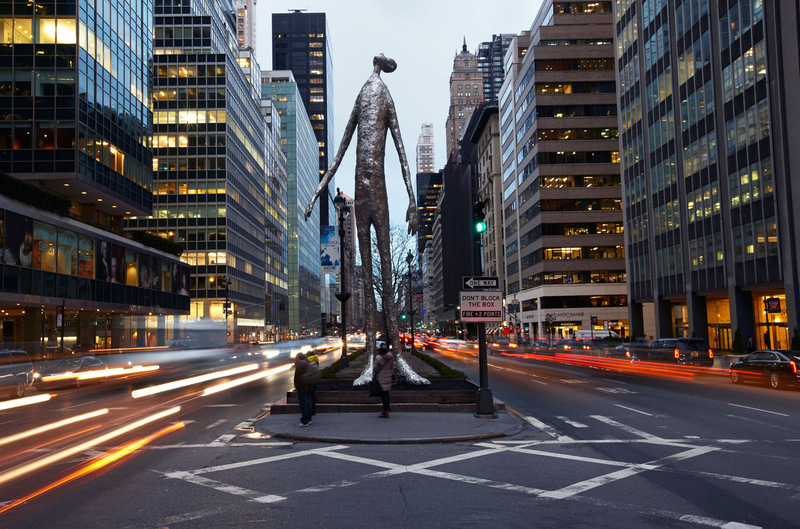 The second in an edition of three, Looking Up was recently installed for six months at the intersection of Park Avenue and 53rd Street in New York City. The first of the edition is permanently installed at The Contemporary Austin, Texas, as part of the Laguna Gloria Campus. The installation of the sculpture will be something of a homecoming for Friedman, who received his Masters of Fine Arts from the University of Illinois at Chicago in 1990. Friedman’s work involves the use of crushed aluminum foil, and other distorted and distressed metal objects, which are used as part of a molding and lost wax casting technique. Coinciding with the new addition to the lakefront will be the 5th annual EXPO Chicago, an international exposition of contemporary and modern art. EXPO will include work from 145 galleries from 22 countries from September 22 through September 25, at Navy Pier.